University of Wisconsin-Green Bay Prof. Meir Russ, Cofrin School of Business, has been named to the Philip J. and Elizabeth Hendrickson Professorship for Business, effective July 1, 2014. He is appointed for a five-year term. The Hendrickson Professorship recognizes and gives support for a full professor who has demonstrated a productive commitment to scholarship and/or outreach and whose work exemplifies the spirit and mission of UW-Green Bay. It is intended for faculty members whose work helps students in the classroom understand the positive role of business in the community and the importance of business ethics. The award is named for Philip Hendrickson, former president and CEO of Krueger International (now KI) and a former member of the Wisconsin Board of Regents; and late wife Elizabeth, who earned her master’s degree at UW-Green Bay and was long active in community philanthropy and civic causes. Russ is a professor in Management for the Austin E. Cofrin School of Business at UW-Green Bay. He received his Ph.D. in Strategic Management, Entrepreneurship, and International Business and his M.A. in Organizational Behavior/Theory from The Ohio State University; and an MBA and a BScEE from Tel Aviv University. Russ currently teaches undergraduate and graduate classes in management and marketing. 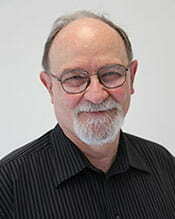 He also teaches a strategic emergency preparedness, planning and implementation class in the Certificate in Emergency Management, Planning and Administration Program at UW-Green Bay. Russ also teaches at KEDGE-Bordeaux School of Management, Roma Tre University, Ph.D. program; and at the University of Pisa, International Master in Business Administration. In addition to his academic focus, Russ serves in a consulting capacity with a number of multinational companies in the area of global strategic management and knowledge management and chairs the Incubator Committee at the Green Bay Area Chamber of Commmerce’s Advance Board. He joined the IAMB Advisory Board in April 2007 and is the founding editor of The International Journal of Management and Business. He also serves on the Editorial Board for the International Journal of Human Capital and Information Technology Professionals. This entry was posted in Faculty/Staff, News, News Releases and tagged achievements, Cofrin School of Business, faculty, Hendrickson Professorship for Business, professional studies, professorships on July 15, 2014 by Kelly Moore.